Folk singer Rosie Sleightholme (‘Utterly wonderful’ BBC Radio Wales) will sing a selection of World War One songs about conscription, politics and war resistance. The songs Rosie will perform have been used in Otherstory Puppetry’s history walk 'Steps Against War’. 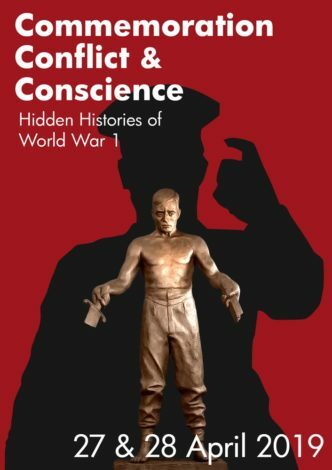 'The Art & Nature of Conscience' explores World War 1 conscientious objectors' thinking about conscience alongside their words and artwork. It also show-cases contemporary artists' reflections on these men, including a new piece by Stephen Raw, 'The Absolutist’s Position' (pictured). BBC TV’s ‘The Monocled Mutineer’ star, Paul McGann, in conversation with Lois Bibbings from Remembering the Real World War 1 and the University of Bristol.